Combining bouncing beach ball fun with wiggling, wild water action, the Beach Blast Ball is an exciting new way to keep cool on hot days! 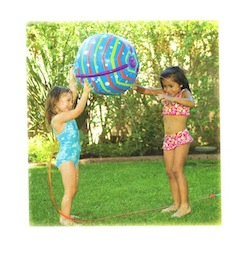 This unique design features multiple sprinklers along the spine of an inflatable ball, spraying water in every direction for maximum giggles. Easily attaches to any garden hose. Children will splash and dash all day as this giant ball dances and moves in every direction, soaking them with every bounce! It's the perfect way to keep the fun rolling all summer long. Ages 3 and up. Ball diameter 18".